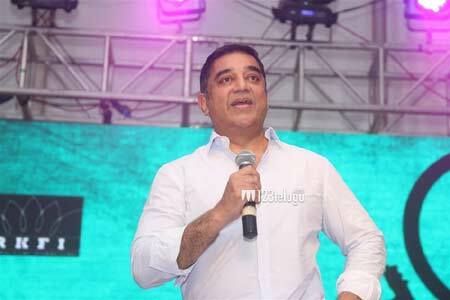 Legendary actor Kamal Haasan’s upcoming film has been launched just a while ago in Chennai. This Tamil, Telugu and Hindi trilingual has been titled Sabhaash Naidu. According to the ongoing buzz, Sabhaash Naidu is an action comedy. The film will be directed by TK Rajeev Kumar and Kamal himself has penned the script. In Sabhaash Naidu, Kamal will be reprising his Balaram Naidu character from Dasavataram, which entertained the audiences with its Srikakulam dialect. Kamal’s daughter Shruti Haasan will be playing her real-life role on the screen as she will be seen as Kamal’s daughter in the film too. Ramya Krishna will be playing Kamal’s wife. Maestro Ilayaraja will be composing the tunes for this film, which will be co-presented by Lyca Productions along with Kamal Haasan’s home banner Raaj Kamal Films International.